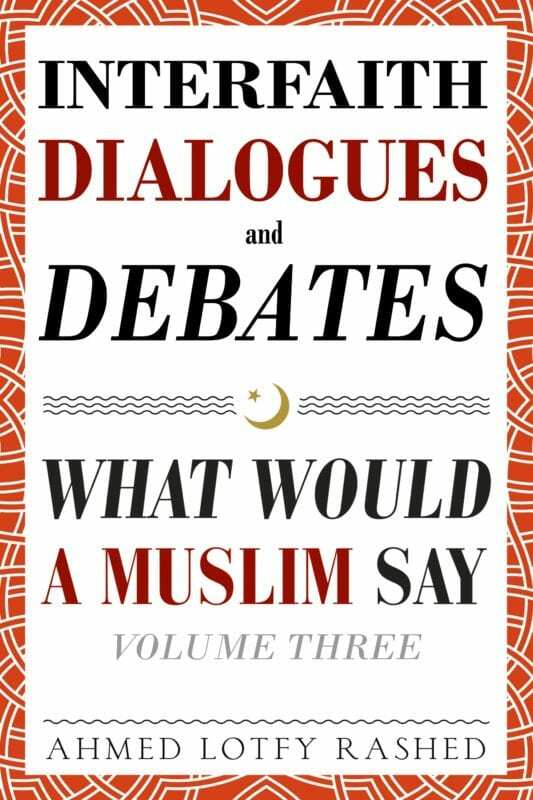 Interfaith Dialogues and Debates: What Would a Muslim Say - Volume 3 | What Would A Muslim Say? Everyone talks about the importance of interfaith dialogue. Many books offer advice on how to conduct interfaith dialogue. . . but in THIS book, you will find actual transcripts of interfaith dialogues, heated debates, and many conversations in between. Here are some of the initial email questions to pique your interest! Sent: Monday, September 12, 2011 11:28 a.m.
Is there some problem Muslims have with Jews? I kind of understand the Palestine-Israel conflict, but it seems like the tension between the two goes deeper. Sent: Sunday, October 2, 2011 1:18 p.m.
What is creation for? Is it just an experiment on God’s part? Is it an amusement or a playful diversion? If God is perfect, then why does he need us as, imperfect as we are? Of course, he could correct us, but is he waiting for us to self-correct individually? Is it beyond us, or did He tell us and we missed the point? Stand firm in faith, as it is all any of us can have. We can do good things here, and things can turn out good eventually. Sent: Thursday, September 29, 2011 7:38 a.m.
Islam is confusing. Right now Iran is going to execute a Christian pastor, all because he refused to recant his Christian beliefs and convert to Islam. Islam is forcing him to convert to Islam. Islam therefore is a vile religion. This is why Islam cannot be the religion of peace, as you try to claim. I’m not talking about terrorists; I’m talking about duly elected governments. Even in Pakistan, Egypt, and all these Muslim countries — all they think about is killing people who don’t follow their way of thinking. Islam is like the mafia, and I am sorry, but you are telling the West a pack of lies about Islam. I know Muslims who have converted to Christianity and are persecuted mercilessly by your clerics. Sent: Wednesday, September 16, 2015 3:52 p.m. Thank you for the introduction. I do have a few questions. What is meant exactly by “remembrance of God?” I hear that term a lot and am not sure what is meant by that exactly. Why would an omnipotent being have a need or care whether we remember him or not? Also, Muslims believe that there were thousands of prophets, so does Islam have a means of determining who was a prophet and who is just claiming himself a prophet? Were women ever considered prophets? Exactly which prophets from the Bible does Islam believe and which does Islam reject? Does a prophet self-identify as a prophet? Finally, why is belief in angels so critical? Sent: Tuesday, November 1, 2016 6:16 p.m.
Do you think the shroud provides proof of Christ’s crucifixion and resurrection?